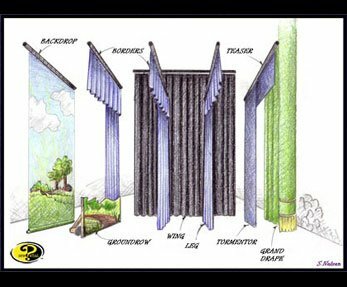 If you’re wondering about the difference between theater curtains and stage curtain types: Teasers, Tormenters, Border Curtains, or Theater Scrims, etc. 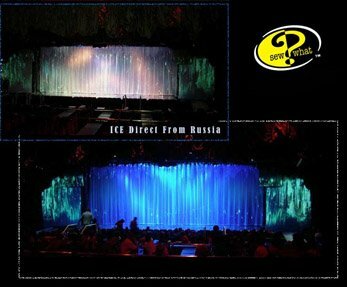 the stage curtain pictures and explanations provided on this page will help. Drape which can be operated by a track, often two overlapping curtain halves. 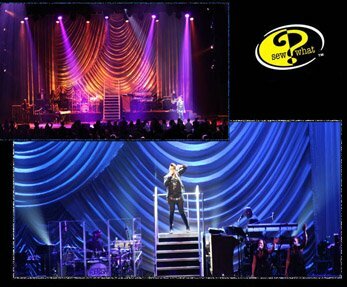 Drapes that open, close and swag to the sides of the stage. 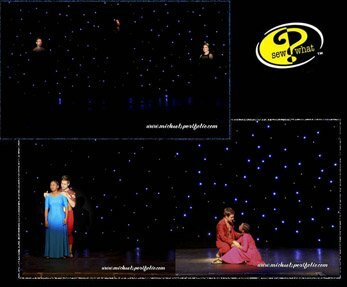 I need a stage curtain – or a drape. Where do I start? Need ideas? Visit our various Portfolios below or our Flickr Gallery for past projects, and then review fabric choices. Check out our numerous Product Categories. Want some background information on drapes? Check other links below. Questions about your project? Call us at (310) 639-6000 or contact us online with questions or for a free quote. More questions on curtains? Visit our White Papers Overview page or resources around flame retardancy for curtains for more information. At Sew What? 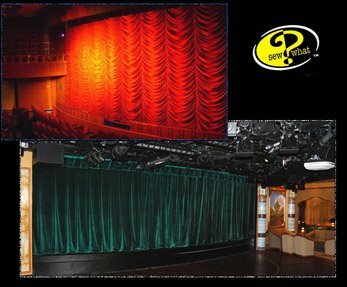 Inc. we welcome any questions that you have about theatre curtains and their uses – general or specific to your need. Our motto is “There are no silly questions”. We are happy to assist. 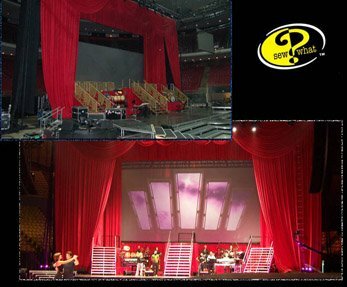 We’ve created theatre curtains and custom stage drapes for some of the largest public and private theatres, television stages, and traveling shows in the world. We’ve also worked with small intimate venues that have special requirements such as packing up the show and storing it or moving it between events.